A STUNNING LISTED GRADE II BOUTIQUE HOTEL OCCUPYING AN ENVIABLE LOCATION ABOVE THE BANKS OF THE GLORIOUS RIVER WYE OVER WHICH IT COMMANDS BEAUTIFUL VIEWS TOWARDS THE PICTURESQUE TOWN OF ROSS-ON-WYE. 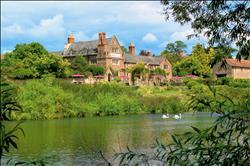 THE HOTEL HAS APPEALING PUBLIC ROOMS OF IMMENSE CHARACTER AND ELEVEN BEAUTIFULLY FURNISHED EN-SUITE BEDROOMS. 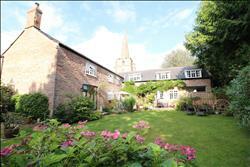 ADJOINING TWO BEDROOM COTTAGE FOR RESIDENT OWNERS. DESPITE THE SECLUDED RIVERSIDE LOCATION, THIS HISTORIC BUILDING IS WITHIN MINUTES DRIVE OF MOTORWAY CONNECTIONS. Atmospheric Reception Area, 58 cover Restaurant, Conservatory and Bar, Wood Panelled Library/Lounge, Meeting/Conference Room, Lavishly Equipped Commercial Kitchen, Wash-Up areas and associated Domestic Offices. Large Beer and Wine Cellar, 11 Beautifully Presented En-Suite Bedrooms. Stylish 2 Bedroom, 2 Bathroom adjacent Cottage. Extensive Sun Terrace, Lawned Gardens. Outbuildings. Generous Car Parking. Riverside Terrace for Alfresco Dining. Motorway connections within minutes drive. A BEAUTIFULLY SITUATED MINIATURE COUNTRY ESTATE COMPRISING A RE-FURBISHED STONE BUILT HOUSE, SELF CONTAINED ANNEXE, AND CLUSTER OF STONE OUTBUILDINGS, THE WHOLE BEING ENCIRCLED BY APPROX 12.75 ACRES OF UNSPOILT PADDOCKS AND PASTURE (TBC). THIS LAND INCORPORATES MANY MAGNIFICENT MATURE OAK AND OTHER DECIDUOUS TREES WHICH LEND TO THE WHOLE A QUITE EXTRAORDINARY FEELING OF SERENITY & WELL BEING. A BEAUTIFULLY POSITIONED AND UNIQUE DETACHED VICTORIAN HOUSE IN ONE THE FINEST RESIDENTIAL AREAS OF THE TOWN AND BEING WITHIN A FEW MINUTES WALK OF TOWN FACILITIES. THE HOUSE OFFERS EXTRAORDINARILY LIGHT SEVEN BEDROOM ACCOMMODATION AND STANDS IN MATURE YET REMARKABLY PRIVATE GARDENS. Enclosed Porch, Superb Reception Hall, Cloaks/Shower Room & W.C., Three Fine Reception Rooms, Kitchen/Breakfast Room, Laundry/Utility Room. Fine Cellarage/Basement. First Floor comprises Four Bedrooms, Shower Room, Bathroom and Separate W.C. Second Floor comprises Three Further Bedrooms and Bathroom & W.C. Over 4,000 sq.ft. in total. Secluded Gardens to the East, South & West of House. Double Garage and Range of Small Outbuildings. Fine Views. Prime Residential Area. Easy Walk Town. A WONDERFULLY POSITIONED DETACHED VICTORIAN HOUSE OCCUPYING A BEAUTIFUL, SECLUDED LOCATION YET BEING WITHIN MINUTES� WALK OF A WIDE RANGE OF TOWN FACILITIES. THE GENEROUS, SIX BEDROOM ACCOMMODATION IS LAID OUT ON 3 FLOORS, WITH A SUPERB AND SPACIOUS CELLAR BENEATH, AND VIEWS FROM VIRTUALLY ALL WINDOWS EMBRACE ATTRACTIVE MATURE DECIDUOUS TREES. Impressive enclosed entrance porch, fine 17� reception hall, 3 reception rooms, 20� kitchen/family room, utility room, rear hall and cloaks and w.c. Outstanding 3 room cellar. First floor comprises 3 bedrooms, each with ensuite facilities. 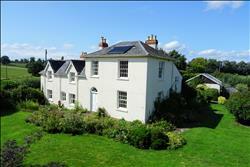 Second floor comprises 3 further bedrooms, and family bathroom and w.c. Fine views. Lawned gardens to front and rear. Private driveway. 15� stone outbuilding. Impressive 25� Reception Hall, Cloaks & W.C., 18� Sitting Room, 30� Kitchen/Dining/Family Room, Utility Room. Galleried Landing, 4 Bedrooms, 3 Bath/Shower Rooms with W.C. Double Glazing. Oil Fired Central Heating. Superb Walled Courtyard & Garden. Beautiful Rural Views. Approx 10 Acres Land with River Frontage & Fishing on Garron. APPROACHED VIA TWO STUNNING, TREE LINED DRIVEWAYS, LINDEN HALL COMPRISES A BEAUTIFULLY CONVERTED STONE AND TIMBER BARN OCCUPYING A TRANQUIL LOCATION AMIDST GLORIOUS HEREFORDSHIRE COUNTRYSIDE. LANDSCAPED GARDENS TO FRONT & REAR, 28� GARAGE/WORKSHOP BLOCK WITH STANDBY GENERATOR AND FINE 26�, TWO STOREY STONE GRANARY. (For those using Sat Nav, we recommend you use the Postcode HR2 8LP (this is different from the actual postcode, but will bring you to the property!). 18� Reception Hall, 19� Music/Dining Room, Cloaks & W.C., Snug, Exquisite 23� Drawing Room, Morning/Garden Room, Study, 18� Kitchen/Breakfast Room, Laundry/Utility Room. Galleried Landing, 20� Master Bedroom with En-Suite Bathroom & W.C., 3 Further Bedrooms & Family Bath/Shower Room & W.C. Oil Fired Central Heating. Beautiful Landscaped Gardens to front & rear. 100� Paved Forecourt. 28� Garage/Workshop Block & 26� 2 Storey Stone Granary. Beautiful surrounding countryside. A BEAUTIFULY REFURBISHED AND GENEROUSLY PROPORTIONED CONVERTED, STONE BUILT COACH HOUSE POSITIONED IN A CONSERVATION AREA OPPOSITE THE CHURCH IN ONE OF THE MOST SOUGHT AFTER VILLAGES IN SOUTH HEREFORDSHIRE. Reception Hall, Cloaks & W.C., Laundry/Utility Room, 19� Farmhouse Kitchen with Aga range, Superb 19� Dining Room, Outstanding 22� Drawing Room with Woodburner. Galleried Landing, 22� x 19� Master Bedroom with En-Suite Bath/Shower Room & W.C., 3 Further Double Bedrooms and Bath/Shower Room & W.C. Flagstone Sun Terrace and Beautiful Walled Garden. 16� Former Stables/Garden Store and Part Walled Vegetable Garden. Classic Village Location. M50 Motorway within minutes drive. A BEAUTIFULLY PROPORTIONED PERIOD COUNTRY HOUSE OCCUPYING A SECLUDED, RURAL LOCATION AND STANDING IN ESTABLISHED GARDENS SOME FOUR MILES SOUTH-WEST OF THE MARKET AND TOURIST TOWN OF ROSS-ON-WYE. FAR REACHING OUTLOOK ACROSS ADJACENT FARMLAND. Front and rear Reception Halls, Cloaks & W.C, Cloakroom, Drawing Room, Dining Room/Snug, Library, Superb Kitchen/Breakfast/Dining Room, Utility Room, Boot Room. 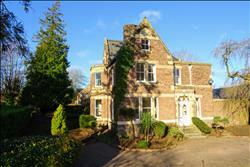 First floor comprises 5 Double Bedrooms with Master Bedroom having excellent En-Suite facilities. Additional Family Bathroom. Green credentials include Air-Source Heat Pump, 18 PV Panels, Solar Panels and Extensive Secondary Glazing. Lawned Garden with many fine mature shrubs and deciduous trees. Excellent Garage/Workshop Block. Hard Tennis Court currently alternatively used. Totally Enclosed Porch, Welcoming Reception Hall, Three Reception Rooms, 18� Kitchen/Breakfast Room with Range, Laundry/Utility Room, Cloakroom, Study and Bathroom & W.C. to ground floor. Five Bedrooms, Dressing Room, Family Bathroom & W.C. and additional W.C. Excellent 300 sq ft Cellar. 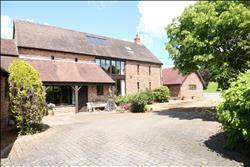 Beautifully converted Single Storey Annexe. Garaging/Workshop. Extensive appealing gardens with many mature trees & shrubs. Gated driveway approach.